The new Range Rover Evoque has achieved the maximum five-star safety rating in latest Euro NCAP testing. The results saw the new Evoque achieve 94% for adult occupant protection and 87% for child occupants along with 72% for vulnerable road users and 73% for safety assist. 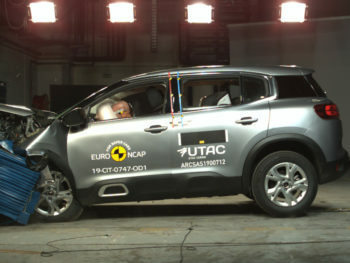 The latest Euro NCAP results also saw a four-star rating for Citroën’s C5 Aircross with standard safety equipment, increasing to a five-star rating when fitted with the optional safety pack. The rating recognises the fact that the standard-fit camera-only Autonomous Emergency Braking (AEB) system can detect and respond to pedestrians while the camera and radar system included with the optional safety pack can detect cyclists as well as pedestrians. In response, Thatcham said the C5 Aircross’s four-star rating was a credible result but expressed disappointment that the AEB cyclist system is not fitted as standard. Avery added: “Citroën drivers are having to pay extra to detect cyclists when other vehicles of similar cost, such as the Ford Focus and Mercedes A-Class, already offer it in their overall price.